The U.S. Fish and Wildlife Service has released its long anticipated 2018 Waterfowl Breeding Population and Habitat Survey Report. As predicted in this space a few weeks ago, overall duck numbers in the traditional northern nesting grounds â€” the so-called Duck Factory of the U.S. Great Plains and southern Canada â€” remain high, even if most species have slipped somewhat from the superb figures of recent years. Overall, biologists with the Fish and Wildlife Service indicate that some 41.2 million breeding ducks were estimated to be on the Prairie Pothole breeding grounds this spring. While 13 percent lower than last year's 47.3 million breeding population figure, this year's number is still 17 percent above the long-term average (LTA) from 1955-2017. The 2018 decline is to be expected with a drop in annual pond count numbers. Overall, pond counts stand at 5.23 million in 2018, down from last summer's figure of 6.10 million. While a 14-percent decline from a year ago, that's statistically the same number as the LTA. In prairie Canada, biologists estimated 3.66 million ponds in 2018, down 15 percent from last year's figure of 4.33 million ponds but still up 4 percent over the LTA. In key northern U.S. Great Plains nesting areas like the Dakotas and eastern Montana, the pond count figure in 2018 is 1.57 million, down from last year's 1.77 million. Those numbers represent an 11-percent decline from 2017 on the U.S. side of the border and an 8-percent decline in the LTA figure. What do all those figures mean in terms of actual duck species breeding numbers? After record breeding numbers of greenheads were observed just two years ago, biologists indicate that 2018 mallard figure checks in at 9.25 million breeders this spring. While that's down 12 percent from last year's breeding population of 10.48 million, that's still a healthy 17 percent above the LTA of 7.9 million. Keep in mind that Ducks Unlimited notes in its news release that the mallard's projected fall flight index number this year stands at 11.4 million birds. While down from last fall's flight index of 12.9 million greenheads, it means that many hunters across North America should still see plenty of mallards backpedaling into decoy spreads. Gadwalls suffered the biggest drop this year, falling from 2017's breeding figure of 4.18 million to 2.88 million this year. While that's a precipitous 31-percent drop from a year ago, federal officials say it's still a whopping 43 percent above the LTA. Other common duck species in this year's USF&WS report include: green-winged teal (3.04 million in 2018, up 42 percent over the LTA of 2.1 million while down 16 percent from 2017); blue-winged teal (6.45 million in 2018, up 27 percent over the LTA of 5.1 million while down 18 percent from 2017); northern shovelers (4.2 million in 2018, up a staggering 62 percent over the LTA of 2.6 million while down 3 percent from 2017); northern pintails (2.36 million in 2018, down 40 percent over the LTA of 4.1 million and down 18 percent from 2017); scaup (both lesser and greater scaup combined, 3.98 million in 2018, down 20 percent over the LTA and down 9 percent from 2017); redheads (999,000 in 2018, up 38 percent over the LTA of 700,000 while down 10 percent from 2017); and canvasbacks (686,000 in 2018, up 16 percent over the LTA of 600,000 while down 6 percent from 2017). The only duck species showing an increase in 2018 is the American wigeon, which has 2.82 million breeders this spring. That is up 2 percent from a year ago and up 8 percent over the LTA mark of 2.6 million. Keep in mind that the numbers mentioned above are the breeding index figures for each species. As noted with the mallard figures above, fall flight numbers will almost certainly be higher for each species, particularly in places where good summer precipitation has improved habitat, aiding in recruitment and possibly even some renesting efforts where habitat conditions allow. "Dry conditions across many areas of the prairies doesn't bode well for duck production," said Dr. Frank Rohwer, president and chief scientist of the Bismarck, N.D.-based Delta Waterfowl, in a news release. "However, timely rains during nesting season, particularly in North Dakota, certainly aided duck production in some regions." Rohwer expresses increasing concern though for a couple of struggling species. "Bluebills are drifting dangerously close to a return to restrictive harvest regulations," he said. "And the pintail number is disappointing. We'd hoped that good wetland conditions across Montana, and portions of southern Alberta and southeastern Saskatchewan, would be enough to give pintails a boost. That was clearly not the case." Rohwer's waterfowl conservation counterpart at the Memphis, Tenn.-based Ducks Unlimited shared some similar concerns. "The dip in the population for prairie-breeding puddle ducks is not unexpected and by no means unprecedented given that conditions on the prairies this spring were drier than last year," said DU chief scientist Tom Moorman, in a news release. "As a result, 2018 populations dropped accordingly," he continued. "However, populations of all key species except northern pintails and scaup remain above long-term averages." With pond count numbers down 14 percent, Rohwer noted that this year's duck breeding numbers remain relatively high thanks in part to wet weather observed in recent years. "Ducks declined due to dry conditions in large portions of the breeding grounds," stated the Delta Waterfowl leader. "Fortunately, we continue to benefit from 'carryover birds' hatched during highly productive springs over the past several years." "The pond count has been above, in some cases way above, the long-term average for many years, and we've enjoyed huge duck estimates as a result," added Rohwer. "This year, the count is average and, in some cases, well below average." All of this points out the need to continue doing the vital work of slowing ongoing wetland losses, conserving current wetlands that remain, restoring old wetlands where feasible, and even finding a few new wet spots where waterfowl can produce their young and thrive each year. "This year's breeding population decline is a reminder of the need to sustain the capacity of breeding habitats, particularly in the prairies as we go through natural variation in wetland conditions," noted DU's Moorman. "Waterfowl populations are adapted well to short-term swings in habitat conditions, but we must continue to guard against the long-term loss of prairie breeding habitat." What will all of this translate into during upcoming duck seasons in both Canada and the U.S.? 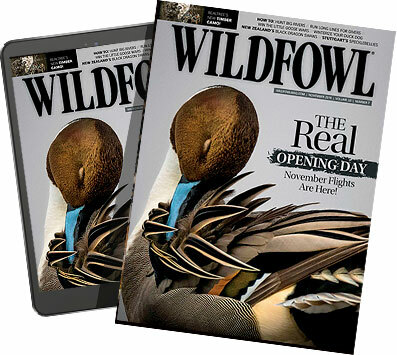 "There will be plenty of ducks in the fall flight, but unlike years when there are plenty of easily decoyed juveniles, hunters can expect savvy, adult birds," predicted Rohwer. The bottom line for duck hunters in 2018 seems to be this: expect plenty of ducks this fall, even if numbers are down from recent years and there are less juveniles in the population. Because even with a decline in production from last spring to this year and drier spring conditions than many of us would hope for, these are still good days to be a North American duck hunter. But whether or not that remains true in the future depends not only on the weather, but also on waterfowlers and their willingness to do the ongoing work of wetland conservation and restoration.